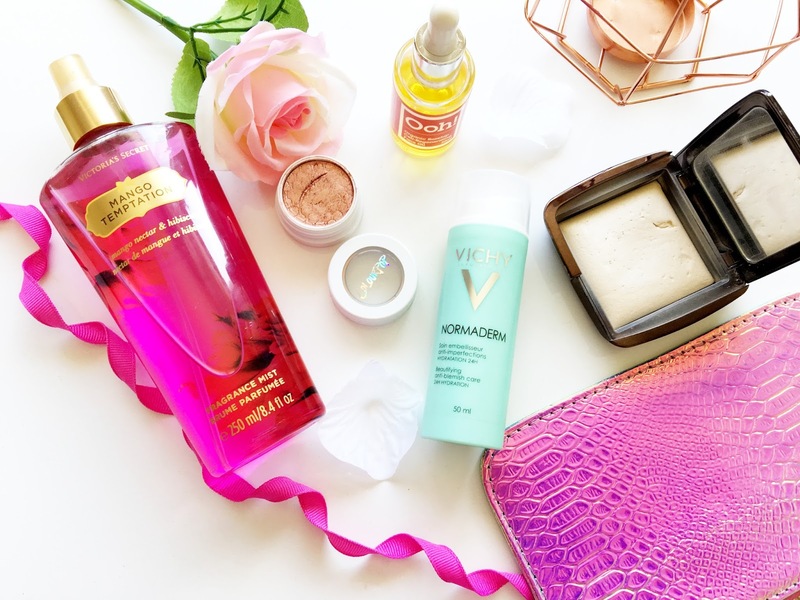 It's seriously insane that I am sat here writing up my September Favourites already. This year has gone by in a flash. It's weird to think that we are only just two months away from Christmas and the New Year, but it's so exciting at the same time. I am loving the slight drop in temperature and the need to live in cosy knitwear and fluffy pjs. Oh I am loving life right now. Compared to last months favourites(see that post here) I have accumulated a few skincare favourites. Last month was fuelled with makeup so it's good to see that I have a bit of variety this time. I've even got a new favourite fragrance too. Let's talk about my favourite fragrance, the Victoria's Secret Mango Temptation Fragrance Mist(£8.99). I bought it with some birthday money that I had at the beginning of the year from Superdrug but I haven't really used it much until now. I have been spritzing it pretty much daily throughout September. It smells absolutely divine, it's so fruity and refreshing. It's the perfect pick me up in the mornings. Colourpop is a brand that is slightly new to me. I only just delved into the brand a few months ago when I made my first order(see my haul here). I have been using the Colourpop Super Shock Shadow in Weenie($5) a lot lately. It is a stunning pinky-rose gold shade with a pearlized finish. The texture is buttery soft and creamy too with amazing pigmentation. I like to use it all over the lid with a darker crease and boy does it make my green eyes stand out. I don't own any eyeshadows like this so I would be gutted if this was to ever get discontinued. It is everything! I don't tend to change up my skincare routine a lot as my skin is pretty difficult. I've had acne since my teenage years so I am sometimes apprehensive about trying new skincare. The one product I didn't expect to like, or even add into my daily skincare regime was face oils. Throughout September I have been using the *Oils of Heaven Organic Rosehip Cell-Regenerating Face Oil(£19) alternatively with other face oils but I bloomin' love this one. It makes my face feel so soft and smooth, like a babys bottom. It's just what I needed to get my skin back in good condition when my skin was drying out. I actually talked more about this over here if you want to know more. Another skincare product is the Vichy Normaderm Beautifying Anti-Blemish Care(£14.50). It's a non-greasy moisturiser that is specifically made for those with blemishes, excess shine and uneven skin texture. That is my skin type down to a tee. It makes my skin feel fresh and quenched with moisture. It's perfect to use under makeup, especially as it's not of a slippery texture. It sinks into the skin so quickly. I'm not sure that I've featured this in my favourites before but the Hourglass Ambient Lighting Powder in Diffused Light(£40) is perfection. It changes the look of my complexion without adding more colour, and instead delivers a soft focus effect to my face. I always seem to opt for this powder over the others. It feels much lighter on the skin too as it's got quite a soft texture to it, plus it doesn't emphasise my pores. It's super pricey for a powder but it's lasted me for quite a long time.